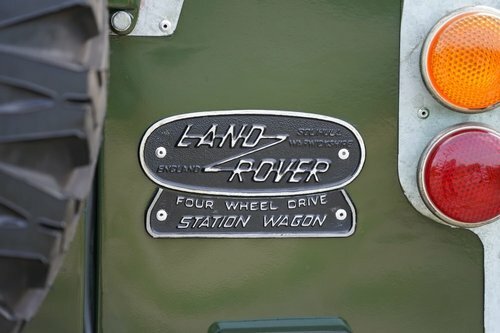 A Rare Opportunity to Acquire a Restored & Very Desirable Series III Land Rover 109" Station Wagon with ex military history. First used in service in 1984 the vehicle was then de mobbed in 2001 which unusually is a very long time for the military to keep a vehicle. 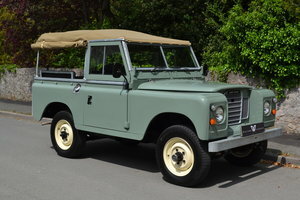 Then Mr. H Shiplee CBE acquired the vehicle and took on the restoration of the vehicle in 2002 and he has owed the vehicle until earlier this year when it came into our care. This lovely example in finished in Bronze Green with a contrasting limestone safari roof. It really does look fantastic. With period correct 7.50 x 16 tyres. 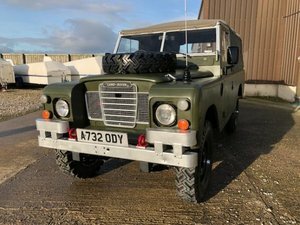 A rare 12 seater vehicle that would be fantastic for a day shooting in the Scottish Highlands, some fishing at the lakes or even a long weekend camping. The vehicle is also matching numbers, totally original throughout and therefore eligible for US export. 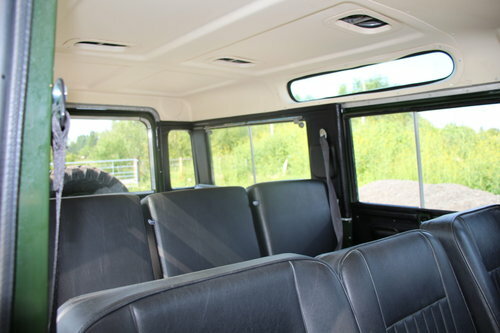 The vehicle is so practical and will be undoubtedly reliable for the long trips due to it's recent rebuild. The clock is showing 48,000 miles which is the original mileage confirmed by the previous owner. The condition of the bulkhead, chassis and running gear would also suggest this also to be true. The vehicle has undergone a thorough and comprehensive restoration, retaining as many original parts as possible. 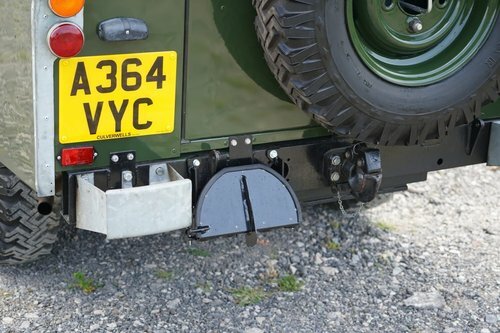 The chassis is original and in remarkably good condition for the vehicle's age, more pictures can be seen of the underside of the vehicle on our website. The rebuild has included the engine, gearbox and axles being overhauled, new exmoor trim seats throughout. LaSalle Trim have supplied the headlining, door cards, side panels, window surrounds at a cost of close to £3,000. New brakes including wheel cylinders, brake pipes, shoes and drums. 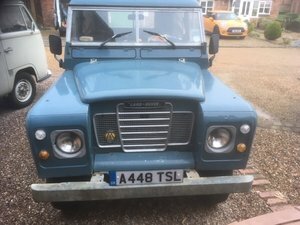 New fuel tanks, shock absorbers, new lights all round, new hoses, clips, door seals, mats, clutch, slave cylinder, master cylinder, new leaf springs, new wiring loom, new servo, carburettor, coil, points, ht leads, window channels and the correct Goodyear Tyres. There is just too much to list. There has been no expense spared on this vehicle, if it needed replacing it has been and further improved. Nothing is required. Hundreds of hours have been spent on this restoration. All the galvanising has been stripped and re done during the restoration the attention to detail is amazing. 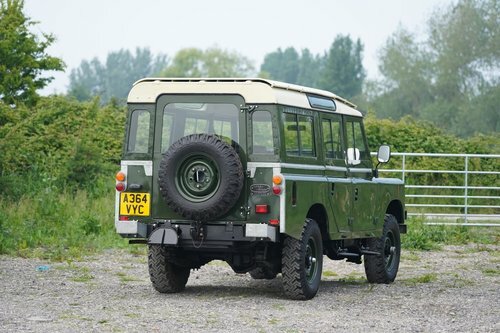 Including all the military extras still intact it has multiple fuel tanks operated by a valve, military bumperettes, nato hitches front and rear, glass lights, side steps, spare wheel strap etc. 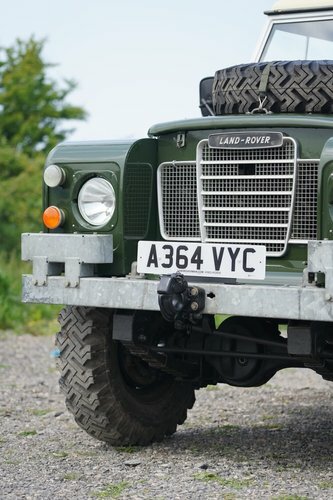 There is an extensive history file including registering the vehicle for road use with the DVLA, pictures of the restoration, mot's and tax discs. One of the best original engine bays we have seen on a Series 3, extremely clean with original stickers still in place. The original 2.25 petrol engine runs very well and has plenty of power and starts straight up even on the coldest of mornings. The engine is painted the correct colours red block and black head which is age correct for a 5 bearing crank engine, The 5 bearing crank engine is much better than the earlier engine there is more power and a much more reliable unit. A joy to drive and such fun, the vehicle will be supplied with a 12-month MOT with no advisories. Four-wheel drive and low range engage, as they should. The gears change up and down as they should which is a good sign of its light use over the years. The vehicle will be fully serviced including engine, oil filter, main gearbox, transfer box, diffs and the swivels. 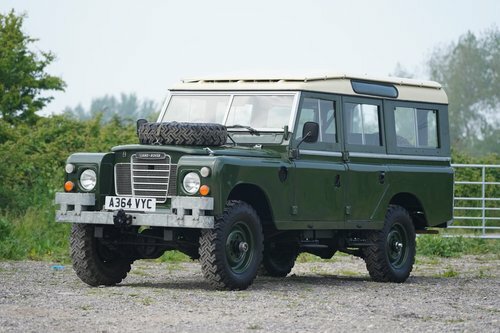 You will have to go a long way to find a better vehicle and we believe this is the best restored Series 3 109" Station Wagon on the market today.